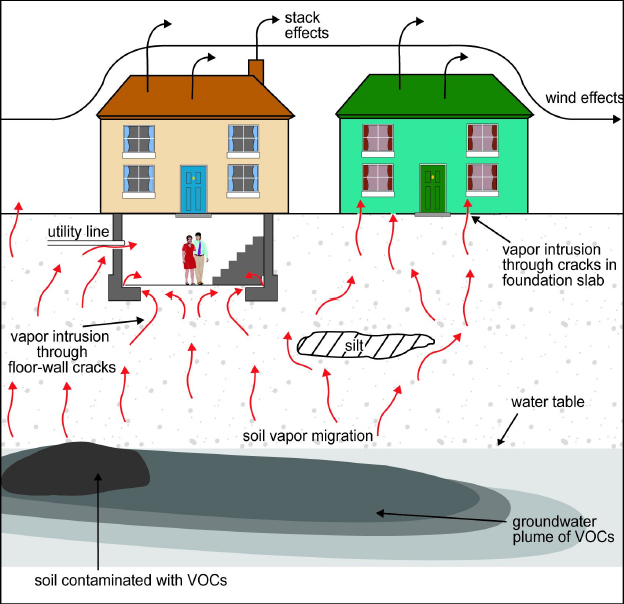 Vapor intrusion refers to the migration of volatile chemicals from contaminated groundwater or soil into an overlying building. Volatile chemicals can emit vapors that may migrate through subsurface soils and into indoor air spaces of overlying buildings in ways similar to that of radon gas seeping into homes. Volatile chemicals may include volatile organic compounds such as PCE from dry cleaners and TCE or DCE from operations using solvents, semivolatile organic compounds and elemental mercury. Sometimes, methane vapors from landfills or gasoline from service stations may accumulate in buildings at levels that may pose near-term safety hazards (e.g., explosion), acute health effects, or aesthetic problems (e.g., odors). However, the more typical situation involves vapors levels that may pose unacceptable chronic health effects due to long-term exposure to these low levels.